After a day spent exploring the Yorkshire Dales or the Moors, relax with a drink on the patio or by the cosy woodburner. 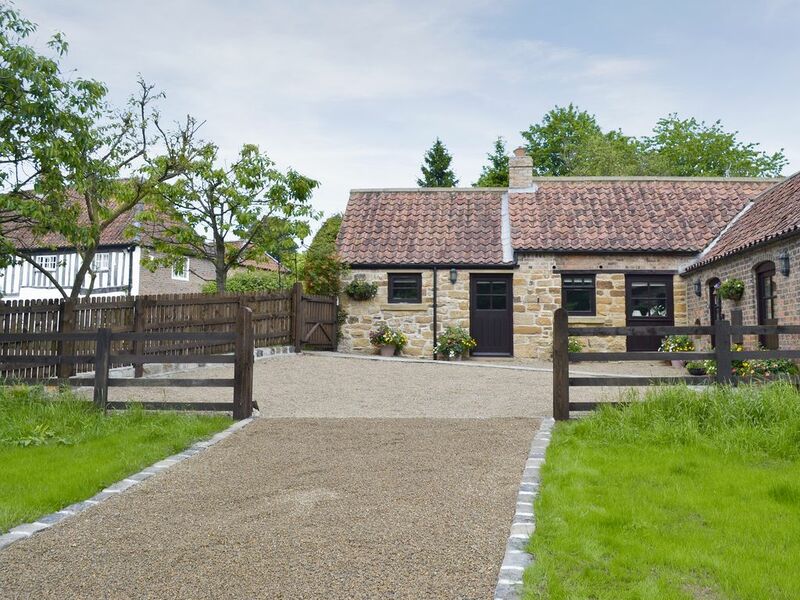 This detached, delightful barn conversion sits in the grounds of the owner’s beautiful Tudor house which dates back to 1450. The property has been skillfully converted into a characterful holiday cottage, with exposed roof timbers and slate tiled floors with underfloor heating. The property boasts a patio which overlooks a field with grazing sheep, perfect for relaxing with a glass of wine on summer days, whilst cosy winter evenings can be spent around the woodburner. Set at the foot of Sutton Bank, on the edge of the North York Moors, this is an excellent area for walking and cycling, and the adventurous might like to visit the Gliding Club at the top of the bank or the Yorkshire Outdoors in Felixkirk for clay shooting and off road driving. Close by is the market town of Thirsk, renowned for connections with the famous vet James Herriot, and there are numerous village inns serving local produce and traditional ales. Visit stately homes at Castle Howard and Nunnington Hall, abbey ruins at Rievaulx and Byland, and the World Heritage Site at Fountains Abbey. Explore the Yorkshire Dales and the Moors, take a trip on the steam train from Pickering to the fishing port of Whitby, or spend a day in the ancient walled city of York, 24 miles. Shop 4 miles, pub and restaurant 400 yards. Oil underfloor central heating, electricity, bed linen, towels and Wi-Fi included. Initial fuel for wood burner included. Welcome pack. Enclosed patio with garden furniture. Bike store. Private parking for 2 cars. No smoking. Please note: Holidaymakers only. No children under 18 years. No guests under 18 years old. There are two internal steps at this property. Initial fuel for the woodburner included, thereafter available locally at cost. Enclosed patio. Holidaymakers, Couples and family bookings only.